1 Co-official with Greenlandic in Greenland, and Faroese in the Faroe Islands. 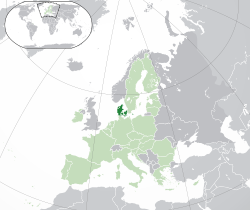 German is recognised as a protected minority language in the South Jutland area of Denmark. Danish is recognized as a protected minority language in the Schleswig-Holstein region of Germany. 2 For Denmark excluding the Faroe Islands and Greenland. The TLD .eu is shared with other European Union countries. 3 The Faroe Islands use +298 and Greenland uses +299.